MDF strength and tips for a first time user. I am about to start putting selling pieces in a booth at an artist market. I have an 8×8 space that I can make my own. essentially they like you to make a room or display case out of your space so my wife wants to make it look like a living room with trim and fake wood paneling on the lower half of the wall. Right now there is just some odd cardboard sheeting with 2×4 or 4×4 every four feet (essentially one on each corner and one in the middle of the wall). I am going to take down the cardboard and put up MDF Panels (I’m thinking 1/2in). It will let me wife paint it the color that she wants and I will be able to easily attach any trim to it that I need so that it looks like a living room. The issue I may have is that I will eventually need to put some shelves in the booth and I am not sure if MDF is going to be strong enough to hold the shelves. I cant imagine having anymore than 40-50 pounds on an approximately 6 foot shelf, but is there anything I should take into consideration when mounting the shelves? My first idea is that I should only drill into the studs, but there is only one in the middle of the wall. Should I consider putting some ply behind the MDF or will the MDF be strong enough to hold a few shelves. The post may have been hard to follow, I typed it purely by stream of thought and edited the best I could. Any help would be appreciated! my suggestion is to treat the MDF as drywall and use a toggle bolt (generally used for wallboard) with a diameter of 1/2 inch. in a 3/4 inch piece of wallboard that can support (roughly) 105 lbs directed away from the wall and 100 lbs directed down the wall. I’ll give a link to where I got these numbers so you can take a look. the chart for toggle bolts and their associated strength is approximately 2/3 the way down the page. my suggestion is to treat the MDF as drywall and use a toggle bolt (generally used for wallboard) with a diameter of 1/2 inch. in a 3/4 inch piece of wallboard that can support (roughly) 105 lbs directed away from the wall and 100 lbs directed down the wall. I ll give a link to where I got these numbers so you can take a look. the chart for toggle bolts and their associated strength is approximately 2/3 the way down the page. Thanks for the quick response and the article john. That sounds like a solid course of action. Screws driven into the face of MDF hold extremely well. Anything driven into the edge won’t hold though. Screws driven into the face of MDF hold extremely well. Anything driven into the edge won t hold though. 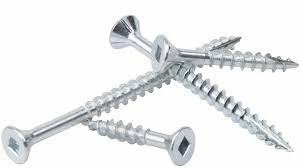 I would suggest using sheet metal screws which have a coarser thread than wood screws. 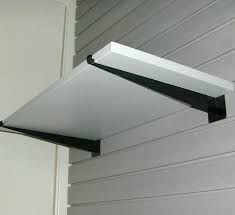 I would use shelf brackets and secure them to the MDF wall with nuts, washers and screws unless you are over a stud. Then use wood screws to secure the brackets to the studs. Thanks for the input. I have heard different things about MDF when it comes to how well it holds screws. You do know that MDF (unless treated) will soak in tons of moisture right? Are the shows you are doing indoors or outdoors? holes should be pilot drilled in MDF. and if moisture is a concern – Medite MDF is the way to go. This is the answer that I would suggest- but there will be many more…. I have built a few things with MDF and confirmat screws and the didn’t have any issues. Here’s one of them. Perhaps I’ll get my wrist slapped for posting something out of my hands on experience but maybe Slat Wall might be of some use to you. I don’t know the ratings on it but they hang stuff on it all the time in store. Don’t get upset folks it just an idea to check into. The fastener that I use with success “Type 17 w/nib” Pre drill 1/8” with a countersink. Caution: If you use a big box product it is not the same as a professional grade MDF and particle board. I am not sure if MDF is going to be strong enough to hold the shelves. 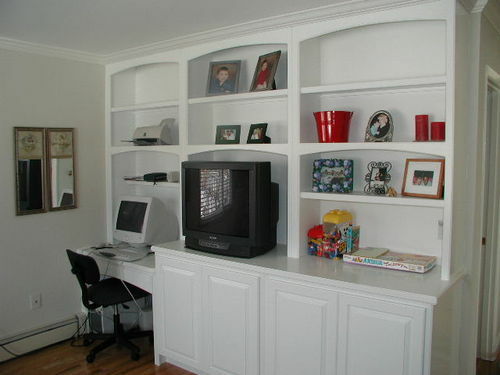 I cant imagine having anymore than 40-50 pounds on an approximately 6 foot shelf, but is there anything I should take into consideration when mounting the shelves? 40 -50 lbs on a 6 foot, 1/2” MDF shelf will sag like the dickens. One thing to consider is weight. MDF is heavy stuff. Is this something that you are ever going move once it is place? I have used those screws before, I still like the confirmat screws for the edge of MDF. If you suggesting I don’t know the difference for the big box stores quality and and the material I get form an honest to goodness cabinet supply place I deal with I might have to block you for the insult. Something I’ve never done before.